I got an email today via last.fm from a lovely chap who saw me play at the Spitz a few weeks ago, and is wanting to bring over a band from Germany, and was looking for some tips on putting on gig. I got on a bit of a roll with the advice, and so thought I’d copy it over here as the ideas are pretty much applicable across the board. And, in reading them, you can see why house concerts are the way to go – minimal overheads, built in marketing network, bespoke venue, and great place to form cool relationships with your audience (assuming that, like me, you find meeting the lovely people who connect with what you do as interesting as playing it to them). Putting on gigs is tough, as it’s affected by so many variables. obviously your first thing to add up is how much it’s going to cost in absolute terms – so that includes all travel, accomodation, fees, equipment rental, additional staff needed and venue costs. Obviously, the smaller the band, the more chance you’ve got of keeping those costs down. Anything with a drummer becomes exponentially more complicated, due to the need for a much more complex sound system, and larger stage area in the venue. Travel from mainland Europe to here can be very expensive too, especially if the musicians are bringing instruments – consider the hand baggage and checked baggage limits on the airlines being considered when you’re looking at costs. Once you’ve looked into that, you need to find a suitable venue. There are some venues that can be had for free – often they are the back room in a pub – but they rarely come with their own PA, and very rarely ever have any kind of built in audience or promotion channel/ticketing mechanism. The alternative is to find a night that already exists and will book them – like the Arctic Circle night that booked Hauschka and Max Richta – while I hadn’t heard of either of them, they clearly have a substantial following that Ben was able to tap into and put on an amazing night, but again, his events have a history and a certain level of ‘regular clientele’ – it’s really tough to put a gig on that makes money without that. As a bench mark for some of the potential costs involved, 5000 A6 double-sided colour flyers costs about £80-£90 – you might be able to split the cost of that with the band’s record label if you put an ad for their latest album on the other side – you then need to get those distributed, either in bars/clubs/restaurants that have flyers available, or by standing outside targeted gigs, giving them out to people who will hopefully be interested. Contacting the press is also tricky if you have no pedigree – I’ve finally started getting good write-ups in Time Out after years of them being largely indifferent to what I did, but I think it’s because someone who was already a fan of mine is now handling the jazz listings there. Bottom line, you can never do too much research, but make sure that you’re not promising something you can’t deliver on – in my head I cut in half the projected audience that anyone says they can bring in if they are putting on a show featuring me – people who like my music always overestimate how interested the general public will be in what I do… They do tend to love it when they get to hear it, but trying to get people out to gigs by people they’ve not heard of before is REALLY difficult. March 25th, 2007 · Comments Off on Tour update… finally! Where did we leave it last time? On the train to Madrid… OK, Madrid – what a great city! I’ve not been to Spain since I was 17, and last time was to a little holiday resort on the South Coast where we went to english-run pubs and sat on the beach, so not really much of Spain was seen. So this was my first proper trip. Madrid’s gorgeous – we were in a hotel right in the middle (thanks to the wonders of Priceline.co.uk), so had ample opportunity to explore. After that it was back to Geneva to see the lovely Paul and Rachel again for a couple of days, then onto Magdeburg, where L had organised a gig through some friends of hers – the marvellous blokes of Studio 201, who were fantastic hosts, great fun, and exemplify the concept of ‘work hard, party hard’ like nobody I’ve ever met before. Deadly serious about having fun, as Michael Franti might say. Anyway, the gig was at UrBar, a very cool music bar/venue in the gorgeous city of Magdeburg, and much fun was had, CDs sold, and plans for a return made. Favourite thing about Magdeburg was Green Citadel, designed by Friedensreich Hundertwasser – definitely in my top 5 wishlist of places to live one day! So, films watched so far – The aforementioned Hudsucker Proxy, Withnail and I, Harry Potter and the Goblet Of Fire, Peep Show series 1, Wedding Singer, Dodgeball, The Life Aquatic and Jump London. Went to a fab gig this evening – MamaYo at Jerusalem, on Rathbone Place in London. Cool venue. Had arranged to meet Yo and Miles before the gig, but thanks to their phone being on vibrate and in the wrong pocket it took 20 minutes to find them… Anyway, once I did, dinner was had, and then back to the venue. I very much doubt there are two nicer people on the planet – both utterly lovely, and as tonight’s gig more than ably proved, awesome musicians. 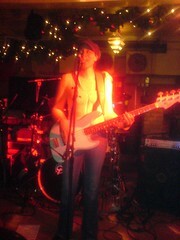 Yolanda is without doubt one of the best funk bassists in the country. That she’s now getting to grips with playing like that AND singing at the same time is too much. Tonight’s gig was a trio gig – they were a quartet last time I saw them play in Manchester at Bass Day, but I think I prefer the more open trio sound – all three are such great players that it just gives everyone more room to shine. Anyway, a fab night. In fact, my second fab night out in a row, cos last night was Seth Horan at which a very, er, ‘select’ audience were treated to some amazing playing and singing from the man himself. Seth’s definitely one of my favourite bassist/singers, and deserved a bigger crowd (don’t we all), but put on a great show, as did his guitar monkey for the evening, Peter Fisher – a really talent germany guitarist. 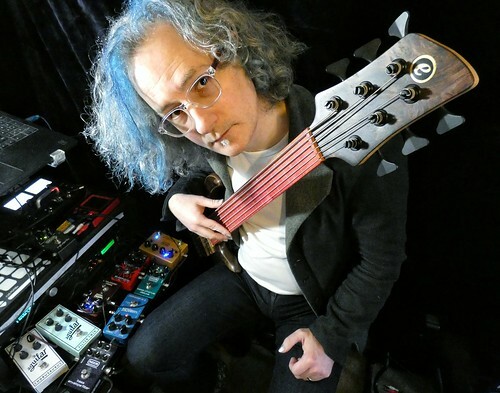 Very nice to see Seth as always, and looking forward to seeing him again at NAMM in January. October 31st, 2006 · Comments Off on Here's the press release for this month's Recycle gig… don't miss it! Home now, after a very easy trip indeed – lunch in Roosendaal station, met a very lovely Horn player on the train from Roosendaal to Brussels called Helen MacDougall (my record on meeting lovely people on trains on this trip has been outstanding, smoking losers in Germany and Switzerland notwithstanding). Eurostar doesn’t take long, so home late afternoon. And it’s good to be home! Oh yes, knowing that I don’t have to drag two basses around on my back, towing a suitcase and a rolling rack behind me. 3) I’m going to find a way to get all my stuff into one bigger bag, rather than two smaller ones. Beyond those, it was perfect, and all being well, I’ll be back touring in Europe in March, so if you’re anywhere in the general European area (basically anywhere between Turkey, in the south, Poland in the east, Finland in the North and Portugal in the west) and want to book me, or know a venue I could play, drop me a line!